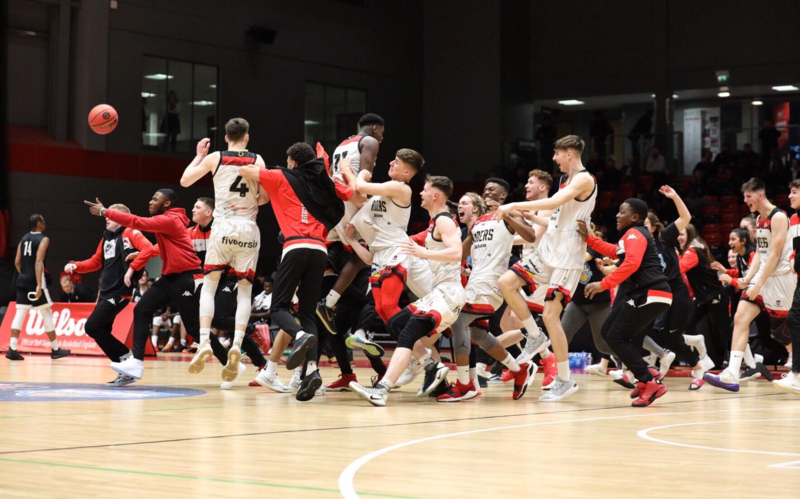 The 2019 EABL Finals did not disappoint as fans and spectators witnessed one of the competition’s greatest ever comebacks with Charnwood College denying Barking Abbey a third straight EABL title with a 75-63 win. By the end of the third quarter, Barking had established a promising lead, as they went into the fourth quarter up 63-44. However, Charnwood weren’t going out without a fight as they pulled off a 31-0 4th quarter, shutting out coach Lloyd Gardener’s side for an unforgettable EABL Finals victory. The first quarter was tightly contested with both teams trading baskets to keep the score close with the post play and toughness of Hosana Kitenge giving Charnwood the slight edge going into the break with a 19–14 lead. Barking started the second quarter strong, taking the lead after an impressive basket from Jonathan Brown in transition. Lloyd Gardener’s team managed to maintain the small advantage before Charnwood responded right before the half to leave the score evenly balanced at 35–31. Coach Lloyd Gardener clearly said all the right things during the break as Barking came out all guns blazing to push the game in their favour behind some great play from Ade Adebayo. Barking’s slick offence combined with some intense defence, forced multiple missed shots and turnovers from Charnwood as the difference on the score board grew. To end the quarter, Tautvydas Mieliauskas and Chris Feeney hit back to back threes to take the quarter 32-9 and an overall lead of 63-44, giving them momentum heading into final period. As the final frame started, Barking could taste a championship victory, but a quick 5-0 run for Charnwood stunned the London side as they got into foul trouble with both Robin Bedford and Jonathan Brown both fouling out mid-way through the quarter. Charnwood’s momentum grew and grew, as each forced turnover from their fighting defense ignited their offensive fire power on the other end. Charnwood’s Niall Harris (17 points) showed why he was the Finals MVP with an impressive scoring display to rally he side back into the game and inspiring his teammates to dig deep to hold Barking scoreless in the final quarter. Their relentless efforts were rewarded as Charnwood eventually gained the lead to seal a comeback that will be talked about for a long time to come. The victory gives Charnwood their second EABL Championship, which they last won in 2015-2016 after defeating Myerscough College.